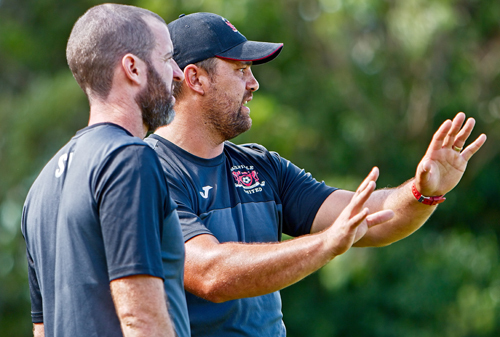 WaiBOP Football Federation is pleased to announce that Michael Mayne (pictured, right) has been appointed as head coach of the Federation’s National Women’s League (NWL) team for the 2018 season. Michael has a strong background of senior coaching experience, including operating in the international environment with New Zealand U-20 and U-17 women’s teams, putting him at the top of a strong group of coaches that applied for the role. After his appointment Michael said he was looking forward to this new challenge. “I’m pleased to be named as head coach. Women's football in the region has always produced international level players and it is in a good space at present. WaiBOP Football shares the same vision in terms how I want to deliver this campaign and I’m pleased I can play a part in promoting football in the region at the highest level for female players. The start of the season, in particular, will be challenging with possibly only a week between the winter league finishing and the first NWL game. “This means we will have to get everyone on the same page pretty quickly, and I will need to rely heavily on the staff involved to approach this task with a real sense of purpose and direction,” explained Michael. “The next steps are to start speaking to players in the region who fit the profile of what we are looking for and making sure no-one who should be in the picture for this campaign is overlooked. I’ve worked with some of the most recent products from the region thanks to the World Cup campaigns I’ve been involved with so I’m aware of the core group of talent within our area. We have a good base to begin with. More announcements about WaiBOP’s NWL campaign will be made during the coming weeks. Players, coaches and fans are encouraged to stay in touch by regularly visiting the Federation’s website. The revamped National Women’s League is set to get going on September 15 and will contain two full, home and away, rounds for the first time. The two highest-placed sides will progress to a one-off grand final on the weekend of December 15-16, the winner of which will lift the trophy.